Perfectly positioned as part of the tranquil and secure "Myaree Gardens" over-55s complex, this light, bright and superb 3 bedroom, 1 bathroom retirement unit (Freehold Strata Titled not Leasehold) is only a matter of footsteps away from the sprawling Marmion Reserve parklands, its picturesque lake and a fantastic family playground, offering low maintenance living in the most enviable of locations. Residents will be able to experience excellent community conveniences, including a communal centre with a library, a sparkling central swimming pool with a barbecue and entertaining area and a gym - plus the bonus of a visiting General Practitioner, a hairdresser and podiatrist. The unit also has its own allocated single carport, just metres away from a staircase that leads up to your front doorstep. The bright open plan living and dining area has sliding doors leading out to the balcony where you can simply sit back and put your feet up. A gorgeous bay window allows natural sunlight to filter through the living and dining area, while a second window gives you direct lake views. A separate study area off the living room also has a lake aspect to enjoy and can be used as a 3rd bedroom. Coupled with the living area, this space is designed for easy living and relaxation. The practical kitchen has a garden aspect overlooking the balcony, 4 burner cook top with oven underneath, 1-1/2 stainless steel sink and plenty of overhead and under bench storage. Both the spacious main bedroom and second bedroom have built in wardrobes and have garden views. 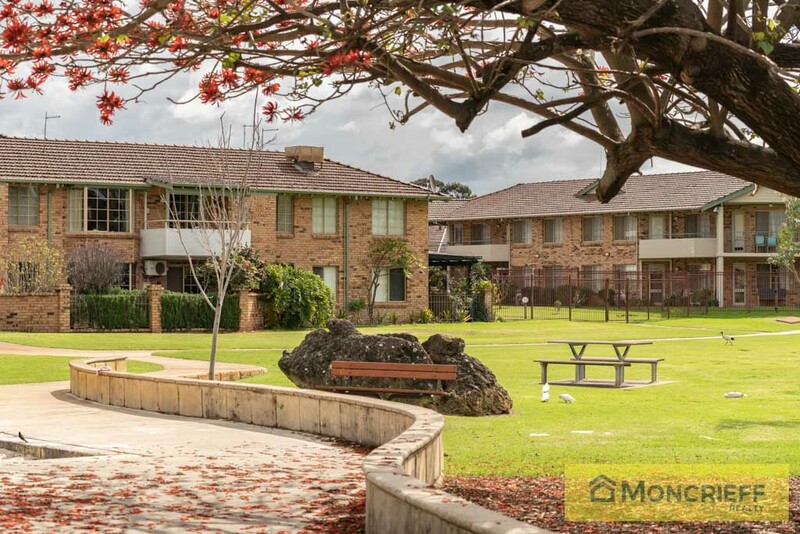 Myaree Gardens boasts an active, friendly, community (with its own weekly activity programme and monthly newsletter). Its located less than a one minute walk to the nearest public bus stop, taking you all the way to both Garden City Shopping Centre and Fremantle. How wonderful!